As you might expect, Scottish traditions are steeped in history and the majority of Scotlands' customs, traditions, festivals and celebrations have been around for centuries. Some may even have been born over a thousand years ago when the joining of Pict-land and Scot-land by Kenneth MacAlpin resulted in the formation of Kingdom of Alba (which would eventually become modern Scotland). As Scots we are enormously proud of our history and culture and take every opportunity to celebrate them both! Because we have such a wealth of history, and are by nature a superstitious culture, there are a wide variety of traditions and customs practiced in Scotland... and by Scots (and their descendants) who live in other countries around the world. Hogmanay is the Scottish New Year Celebration traditionally held on December 31st each year when Scots see out the old year and welcome in the new one. Where does the word 'Hogmanay' come from? The word Hogmanay is Scottish for New Years Eve, but it's not a Gaelic word and no one is entirely sure where it originated, or what it means. According to the BBC website, there are a few contenders for the meaning of Hogmanay, including it being from the French word 'hoginane' which means gala day, from the Anglo Saxon 'haleg monath' meaning Holy month, from the Scandinavian 'hoggo-nott' meaning Yule , or from the Swedish words 'hg' and 'mne' meaning high/full and moon respectively. As historians believe that the very first Hogmanay celebrations were brought to Scotlands' shores by Viking invaders (from the region that is now divided into Sweden, Norway and Denmark) as early as the 8th or 9th century, my vote is for the Scandinavian or Swedish versions! In Scotland, Hogmanay is often anticipated more eagerly, and celebrated more enthusiastically, than Christmas Day. 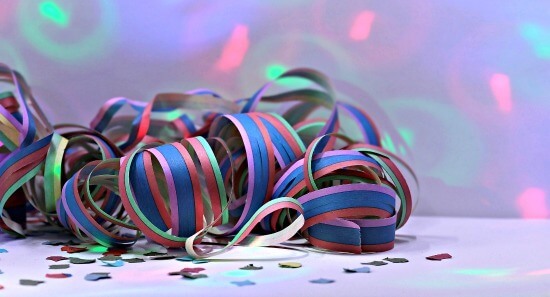 I still remember the Hogmanay parties my family threw every year. They were more for the adults than for the children and once us kids were out from underfoot the adults played raucous games, laughed, drank and at the stroke of midnight sang 'Auld Lang Syne' at the top of their voices. Meanwhile I just wanted to be old enough to join in the real fun! The Scottish tradition of Hogmanay involves several customs and superstitions, including 'First Footing', 'Saining' (a blessing) and 'Redding' the house and, of course, the singing of Robert Burns' Auld Lang Syne. Fire (or fireworks) is often part of Hogmanay customs and celebration. Historically the fire may have been in the form of torchlight processions (which still abound today) and also bonfires which were part of the celebration. What do you think of when I say 'Highland Games'? If you have a mental image of large men throwing tree trunks to the accompaniment of bagpipe music and kilted dancers, then you've got the general idea, but there's lots more. Although the Highland Games of today are very different from the earliest versions of the competition, there are also many similarities. Scottish traditions have their roots deep-set in history, and the Highland Games have been around for over a thousand years, perhaps even longer. Today's games are at the same time, both similar and dissimilar, from the original Clan contests which are at the roots of these games. There's not hard-and-fast, proven theory as to how or why this highland competition first appeared, but there are three main hypotheses and the truth may lie in a blend of two, or more of them. What may have begun as a method of finding the fittest, fastest and strongest men for clan duties or for showcasing their potential as soldiers, has become an inspiring, colorful and enthusiastic display of both athleticism and national pride. In Scotland most Highland Games are usually held between May and September, and there are as many as a hundred different individual games held annually across the country. As Scots emigrated around the world they took their Scottish traditions and customs with them, and there are Highland Games held in countries all around the world, including countries as diverse as the United States, Canada, Australia, New Zealand, South Africa, Brazil, Japan.. and more. Modern-day Highland Games aren't just athletic competitions reveling in strength and endurance. 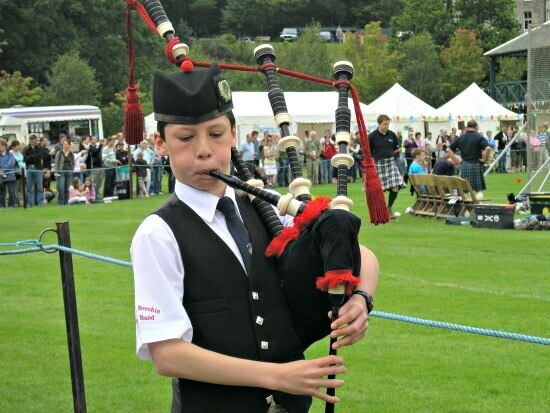 They're also family-friendly festivals which feature traditional highland dancing and piper displays, and include traditional food and drink as well as Scottish merchandise from kilts and clan crests to celtic jewelry and a whole range of other items. 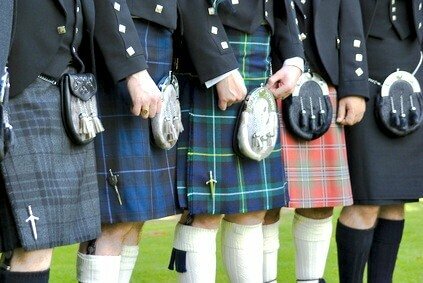 The Scottish kilt is a bold, and eternally stylish, symbol of Scotland's culture, and is always worn with pride. Today's kilts originated from the versatile Great Kilts (aka Feileadh Beag, pronounced Fee-la Beg) of the 16th century, and the Walking Kilts of the 17th and 18th centuries, which were worn by Highlanders for practical reasons more than style. Most tartan patterns are closely linked to specific Scottish Clans and are still worn by clan members today, especially for ceremonies, weddings and holidays. Burns Night (aka Burns Supper) celebrates the life and works of Robert (Rabbie) Burns, a world-famous Scottish poet and writer who lived during the 18th century. It's held on January 25th (the anniversary of Roberts' birth in 1759). It isn't an official holiday (businesses are open as usual) but a Burns Supper is a very popular event and people all across Scotland, and in other places around the world, join in with gusto. When was the first Burns Supper? The first Burns Supper (aka Burns Night) was held by friends of the poet/writer in July of 1801 in commemoration of the fifth anniversary of his death. With food, speeches and readings of Burns' work this event was such a success that it was decided to continue it every year, and to celebrate his birth rather than his death so the annual date became January 25th. What Is A Traditional Burns Night? Burns Night traditionally includes a dinner with a specific menu preceded by the Selkirk Grace (attributed to Robert Burns and possibly adapted from an earlier grace which was popular in the 17th century). Readings, recitations and even songs from Burns' huge volume of work are the entertainment and speeches are popular too. The night wouldn't be complete without some good Scots Whisky to wash down the food and lubricate the vocal chords! What do you eat at a traditional Burns Supper? 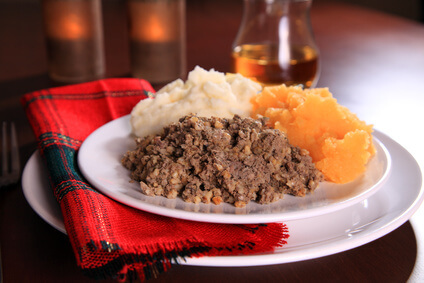 Haggies with Tatties 'n Neeps is the traditional Burns Supper meal. This is haggis accompanied by mashed potatoes and also mashed turnips (aka rutabago or swede). It's up to the host to pick dessert/desserts (called pudding in the UK) but a traditional Scottish dish is the obvious choice. Possibilities include Clootie Dumpling (a steamed pudding made with dried fruit and spices) or Cranachan (a cold dessert made with cream, fresh fruit and toasted oatmeal). Buttery Scottish shortbread or a layered trifle are also great options. Whatever is chosen, whisky-laced cream is a popular touch. The Selkirk Grace is said when everyone is seated, then the haggis is brought to the table accompanied by bagpipes (either an actual piper or music being played). Burns 'Address to a Haggis' is recited by the host and then a toast is made to the haggies before everyone gets down to the serious business of eating. What happens at Burns Night? Once the Burns Supper has been eaten and cleared away everyone takes part in reading and/or reciting some of Robert Burns' work... and there is a LOT to choose from. But first is the 'Immortal Memory Address' which is basically a speech about Burns and his work, given by a designated speaker, and is open to interpretation in terms of exact content, length etc. It ends with a toast to the Bard of Ayr (whisky traditionally of course). Toast to the Lassies is a gentle fun-poking at the women, and Reply to Toast to the Lassies is a response in kind to the men. This is all done in fun, and should be kept light-hearted! The famous Tam O'Shanter is a popular recital at any Burns Night. 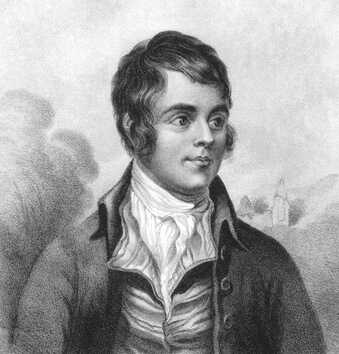 You might want to check out this complete list of the works of Robert Burns for inspiration or just to marvel at how prolific he was for someone who lived only thirty-seven short years. At the end of the get-together everyone sings Auld Lang Syne in the traditional way with arms crossed while holding hands. Ceilidh is a Scottish Gaelic word (pronounced Kay-lee) which can mean a party, a social event, a visit or a gathering. Traditional Ceilidh's include bagpipes, folk music, country dancing, storytelling, poetry-reading, food, drink and fun. Historically, Ceilidh's were regular bright spots during the long winter months in towns, villages as well as in remote and isolated communities. When there was no radio, television or internet to keep people amused or to connect them, this type of gathering was the best entertainment in town. Often Ceilidhs were held in village or town halls, or in smaller hamlets, in a someones' home. Certain dances are traditional at these gathering/parties, and the Gay Gordons, a dance which originated over a hundred years ago, is often the first one. Other popular dances include Strip The Willow, the Dashing White Sergeant and the Flying Scotsman. The links above will take you to video tutorials for these dances! Today, traditional Ceilidhs still take place, more so in the west of Scotland than in the east, and also most commonly in rural, islolated or Highland locations. Village Halls are a popular venue. You can also find Ceilidhs today, anywhere in the country at celebrations such as Scottish weddings or engagements, and as entertainment for tourists at some hotels. There are lots of Ceilidh bands which perform at events all over Scotland, here's a look at one called Skippinish. Toe tapping stuff! 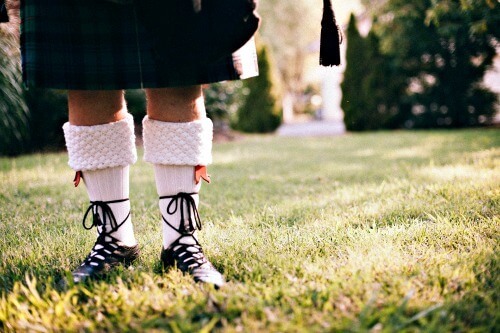 Scottish weddings are rich in tradition, and the happy couple have some unique pre-wedding rituals to take part in too! 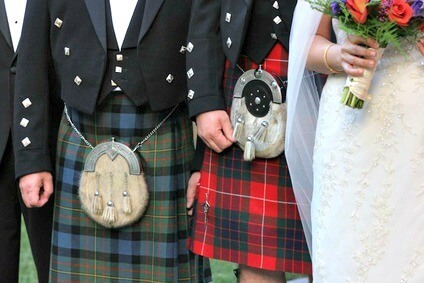 From wedding dress to wedding rings, the service, reception decor and much more, the Scottish flavor and style is very much in play. 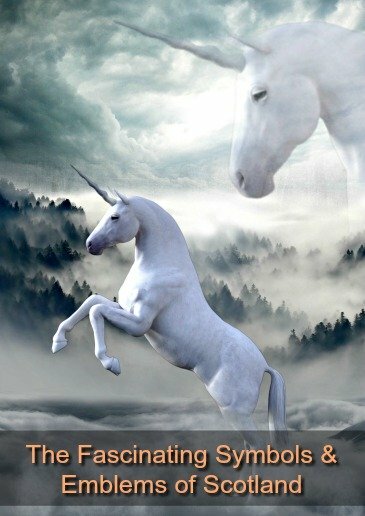 Find out how to add some Scottish magic to your big day here.